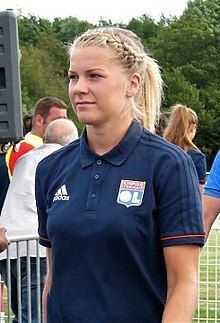 Ada Martine Stolsmo Hegerberg (born 10 July 1995) is a Norwegian professional footballer who plays as a striker for the Division 1 Féminine club Olympique Lyonnais. She has previously played for Kolbotn and Stabæk in Toppserien. Hegerberg has represented Norway at the youth international level, and made her debut for the senior team in 2011. In 2013, she was a part of the Norwegian team that won the silver medal at the 2013 UEFA Women's Championship. She also took part at the 2015 FIFA Women's World Cup and the 2017 UEFA Women's Championship. Hegerberg won the 2016 UEFA Best Women's Player in Europe Award on 25 August 2016, and in 2017 was named BBC Women's Footballer of the Year. In 2018 she was the first ever recipient of the Ballon d'Or Féminin. Hegerberg was born in Molde, but grew up in Sunndalsøra where she played for Sunndal Fotball along with her older sister Andrine. In 2007, their family moved to Kolbotn, where the sisters later joined Kolbotn IL. She made her debut for Kolbotn in 2010. On 6 August 2011, she scored three goals in seven minutes as Røa were beaten 4–1, with Andrine scoring the last goal. Aged 16, this made her the youngest player ever to have scored a hat-trick in Toppserien. While still 16 years old, she finished as Kolbotn's top scorer in the 2011 Toppserien season and was voted as the league's Young Player of the Year. Ahead of the 2012 season, both Hegerberg sisters joined Stabæk. During a match against Fart in May 2012, she scored five goals during the first half of Stabæk's 8–2 win. At this stage the sisters were considered to be two of the biggest talents in Norwegian women's football, and Ada won the Statoil "Talent of the Month" award for the second time in May 2012. She became top goalscorer in the 2012 Toppserien with 25 goals in 18 matches. She also contributed two goals in the semi-final of the 2012 Norwegian Women's Cup, when Amazon Grimstad were beaten 3–0. Stabæk's 4–0 final victory over Røa saw Hegerberg score a hat-trick. In 2013, she and her sister signed contracts with the German side 1. FFC Turbine Potsdam until 30 June 2014, where they became teammates of their countrywoman Maren Mjelde. Hegerberg scored in her Bundesliga debut when SC Freiburg was beaten 3–1. In their first season in Germany, the Hegerbergs and Turbine finished second in both the 2012–13 Bundesliga and the 2012–13 DFB-Pokal. In the summer of 2014, she transferred to Olympique Lyonnais. Hegerberg had a very successful first season in France. She scored 26 goals in 22 league games, leading Lyon to a ninth consecutive Division 1 Féminine title. In the Coupe de France Féminine Final, Hegerberg scored the tying goal in the 47th minute, eventually culminating in a 2–1 victory over Montpellier. Hegerberg returned to Lyon for the 2015–16 campaign. On 27 September, she scored a hat-trick in Lyon's 5–0 victory against rival PSG. Hegerberg became the first player to score a hat-trick against PSG since Julie Morel in October 2008. In November, Hegerberg reached an agreement on a contract extension to stay with the club through the 2019 season. Lyon retained the league title for the tenth time in a row on 8 May 2016. Hegerberg finishing the season as the top scorer of the league with 33 goals in 21 appearances. One week later, Hegerberg secured the Coupe de France with Lyon. In UEFA Women's Champions League action, Lyon went on to win the competition behind Hegerberg's 13 goals in 9 matches, to complete a treble. On 3 December 2018, Hegerberg became the first ever winner of the Ballon d'Or Féminin. There was controversy during the ceremony, however, as the host, DJ Martin Solveig, asked Hegerberg upon receiving the award if she wanted to dance in celebration and "knew how to twerk", who in turn responded "no". His comments were criticised as sexist in the media; he later apologised for his remark. Regarding the incident, Hegerberg later commented: "He came to me afterwards and was really sad that it went that way. I didn’t really consider it sexual harassment or anything in the moment. I was just happy to do the dance and win the Ballon d’Or." Concerning her award, she also added: "It’s incredible. This is a great motivation to continue working hard and we will continue to work together to win more titles. I wanted to end with some words for young girls around the world: believe in yourselves." At the age of 15, Hegerberg was a part of the Norwegian under-19 team that qualified for the 2011 UEFA Women's U-19 Championship. She was also included in the squad for the final tournament, where Norway reached the final. Hegerberg was included in the Norwegian squad for the 2012 FIFA U-20 Women's World Cup, there the team reached the quarter-final. She and Andrine scored the goals in a 2–1 win over Canada in the group stage. She made her senior debut for Norway as a substitute in a 3–1 defeat to Northern Ireland in Lurgan on 19 November 2011. Hegerberg was selected in the Norwegian squad for the 2013 UEFA Women's Championship and made her championship debut in the opening match; a 1–1 draw with Iceland on 11 July 2013. She scored her first goal in the tournament as Spain were defeated 3–1 in the quarter-final and played the entire 90 minutes as Norway lost the final 0–1 to Germany. Hegerberg was a member of the Norwegian squad for the 2015 FIFA Women's World Cup. She scored three goals in three group stage games, highlighted by a two-goal performance in Norway's 3–1 win over Ivory Coast. Hegerberg was nominated for the Best Young Player Award for her efforts. In January 2016, Hegerberg was awarded the 2015 Norwegian Gold Ball, given to the best footballer in Norway. She was the first woman to win the award in 20 years. In the summer of 2017, Hegerberg decided to take a break from international football. 1Includes Norwegian Cup, DFB-Pokal and Coupe de France. Ada Hegerberg with Lyon in 2014. ^ "FIFA U-20 Women's World Cup Japan 2012 List of Players Norway" (PDF). FIFA. Retrieved 23 September 2013. ^ "2015 World Cup" (PDF). 2015. ^ "Ada Stolsmo Hegerberg Profil" (in Norwegian). Retrieved 12 March 2015. ^ "Norway Mediaguide 2013" (PDF). Football Association of Norway. p. 10. Retrieved 23 September 2013. ^ a b Debove, Julien (4 June 2011). "Hegerberg sisters unite for Norway success". UEFA. Retrieved 23 September 2013. ^ "Hegerberg månedens fotballtalent for Juli". fotball.no (in Norwegian). Football Association of Norway. 13 September 2011. Archived from the original on 22 September 2013. Retrieved 23 September 2013. ^ a b c Hellen, Bjørnar; Traaen, Olav (13 December 2012). "Hegerberg-søstrene til tysk toppklubb" (in Norwegian). NRK. Retrieved 23 September 2013. ^ "16-åring senket serielederen med hattrick" (in Norwegian). Aftenposten. Norwegian News Agency. 6 August 2011. Archived from the original on 17 September 2013. Retrieved 17 September 2013. ^ a b Gulbrandsen, Ragnhild (12 December 2011). "Stabæk forsterker ytterligere" (in Norwegian). Budstikka. Retrieved 17 September 2013. ^ "Hegerberg-søstrene til Stabæk" (in Norwegian). Norwegian News Agency. 12 December 2011. Retrieved 21 January 2012. ^ Weiberg-Aurdal, Jan Magnus (11 May 2012). "Stortalent (16) scoret fem mål på én omgang: – Jeg gjør bare jobben min" (in Norwegian). TV 2. Retrieved 17 September 2013. ^ "Ada Stolsmo Hegerberg er månedens fotballtalent - mai 2012" (in Norwegian). TV 2. 24 May 2013. Retrieved 23 September 2013. ^ Flygind, Kjetil (10 October 2012). "Her sender Hegerberg Stabæk til cupfinale" (in Norwegian). Fædrelandsvennen. Retrieved 17 September 2013. ^ Løken, Hans Henrik (24 November 2012). "17-åring blei cupheltinne for Stabæk" (in Norwegian). NRK. Retrieved 17 September 2013. ^ "Potsdam signs Norwegian trio" (in German). womensoccer.de. 14 December 2012. Retrieved 10 February 2013. ^ "Debuterte i Tyskland med scoring" (in Norwegian). Tidens Krav. Avisenes Nyhetsbyrå. 17 February 2013. Retrieved 23 September 2013. ^ Berge, Andreas Kristoffer (6 July 2013). "Maren Mjelde og Ada Hegerberg om sesongen i Tyskland og EM". Fotballmagasinet (in Norwegian). Archived from the original on 30 September 2013. Retrieved 23 September 2013. ^ "Ada Hegerberg wechselt zu Olympique Lyon". www.womensoccer.de. ^ "OL - Montpellier en live" (in French). Le Liberto Lyon. 18 April 2015. ^ a b Ed Aarons (4 December 2018). "Ada Hegerberg: first women's Ballon d'Or marred as winner is asked to twerk". The Guardian. Retrieved 4 December 2018. ^ "Ukens profiler: Ada og Andrine Hegerberg". fotball.no (in Norwegian). Football Association of Norway. 6 April 2011. Archived from the original on 16 September 2013. Retrieved 17 September 2013. ^ "Hansen og Hegerberg-søstrene reddet Norge" (in Norwegian). Verdens Gang. Norwegian News Agency. 23 August 2012. Retrieved 23 September 2013. ^ "Graham Hansen og Hegerberg starter for Norge" (in Norwegian). Dagbladet. Norwegian News Agency. 11 July 2013. Retrieved 23 September 2013. ^ Lote, Arve (22 July 2013). "Tom Nordlie: - Dette er et "YouTube-selvmål"" (in Norwegian). NRK. Retrieved 23 September 2013. ^ Ytterstad, Matias; Vistnes, Oddbjørn (28 July 2013). "Tok til tårene etter at gullet røk" (in Norwegian). Dagbladet. Retrieved 23 September 2013. ^ uefa.com. "Women's World Cup - Norway – UEFA.com". UEFA.com. Retrieved 4 August 2015. ^ "Hegerberg's 2 goals lift Norway past Ivory Coast 3-1". Retrieved 4 August 2015. ^ "Kadeisha Buchanan, Ada Hegerberg, Tang Jiali nominated for Young Player Award". Retrieved 4 August 2015. ^ "Ada Stolsmo Hegerberg's profil". fotball.no (in Norwegian). Football Association of Norway. Archived from the original on 12 May 2012. Retrieved 25 September 2013. ^ "Ada Stolsmo Hegerberg" (in German). 1. FFC Turbine Potsdam. Retrieved 25 September 2013. ^ "Ada Hegerberg statistics" (in French). footofeminin. Retrieved 13 November 2014. ^ a b c "Ada Hegerberg". Soccerway. Retrieved 21 January 2019. ^ "Hegerberg, Henry, Marozsán are women's nominees". UEFA. ^ "Ada Hegerberg voted Best Women's Player in Europe". UEFA. ^ Karla Bustamante del Valle (3 September 2018). "Nominadas al premio "The best"" (in Spanish). AS.com. Retrieved 21 January 2019. ^ Beaard, Raymond. "Las mejores futbolistas: el Once Mundial - FIFPro World Players' Union". ^ "BBC Women's Footballer of the Year 2017: Ada Hegerberg wins award". BBC Sport. 30 May 2017. Retrieved 30 May 2017. ^ "Luka Modric named best male player and Marta best female player at Fifa awards". BBC News/Sport/Football. 24 September 2018. Retrieved 26 September 2018. ^ "IFFHS AWARDS – THE WOMEN WORLD TEAM 2018". IFFHS.de. 1 December 2018. Retrieved 5 December 2018. Wikimedia Commons has media related to Ada Hegerberg.